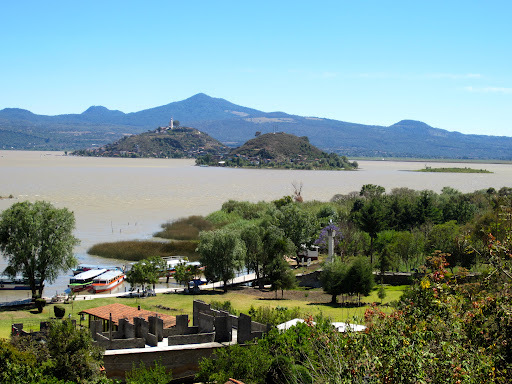 Lago de Patzcuaro/Lake Patzcuaro | ¡VidaMaz! 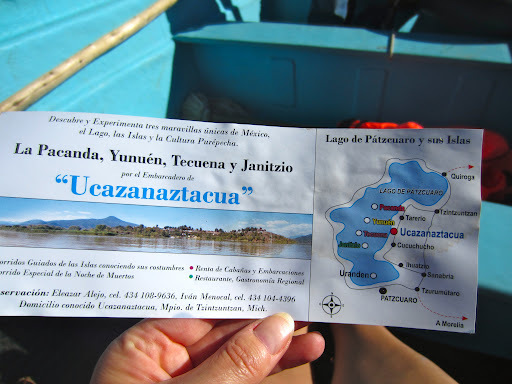 We very much wanted to see the islands on Lake Patzucuaro, especially the ones that aren’t quite so popular, that are a little more local. 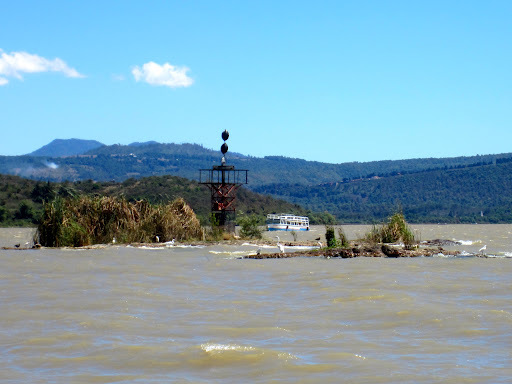 Since yesterday we needed to go back to Capula to pick up our Catrina from Juan Carlos and his wife, we decided we’d drive from there along the eastern side of the lake, hope for a view, and try to find a boat launch that didn’t require us to go all the way back into the Semana Santa crowds of Patzcuaro. It sounded rational enough. 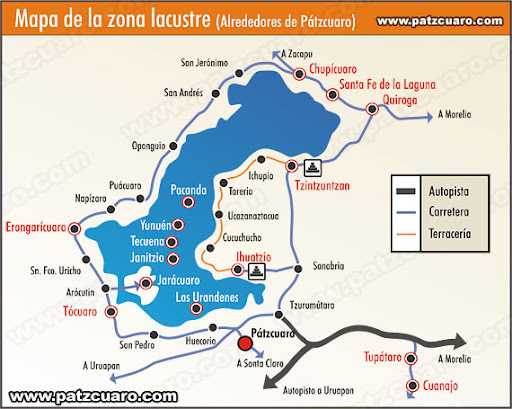 NOTE: the map above, which is very typical, shows the three Urandenes and Jarácuaro as islands. They are now landlocked. 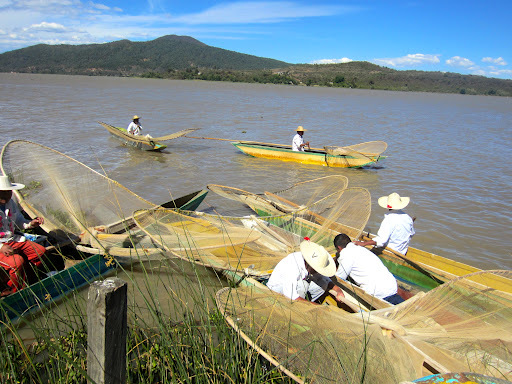 The four islands are Pacanda, Yunuén, Tecuena and Janitzio. 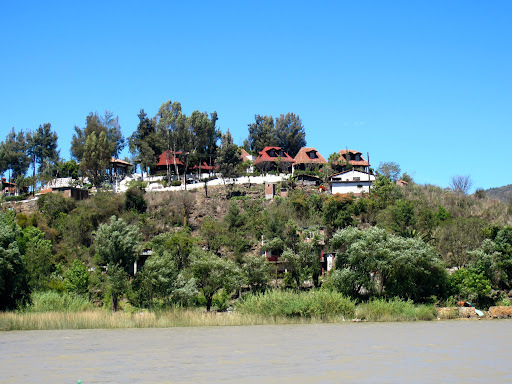 The trouble is, in researching on the internet, every site tells you that the only boat launch on the lake is in Patzcuaro. 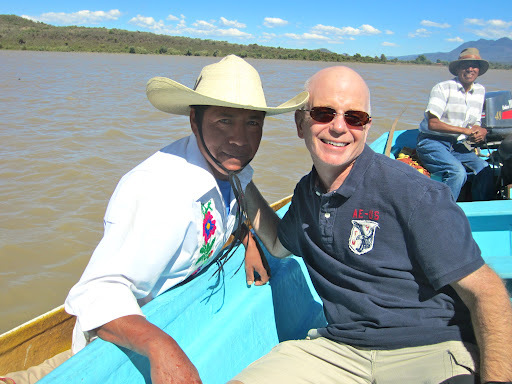 Very hard for me to believe that on that huge lake there would be only one boat launch, or that we wouldn’t be able to find someone with a boat who’d like an extra 500 pesos to take us on a tour, so off we went. 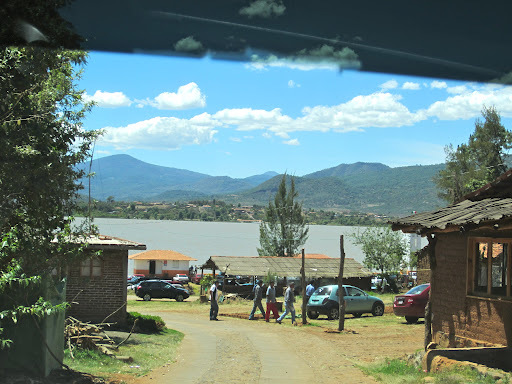 In Tzintzuntzan we drove toward the lake, then headed south along it. This was a road that was not on any of our maps; it was way closer to the lake than the eastern perimeter road. The views were great. At points south of there the road became very washboard-like. We began to lose faith. 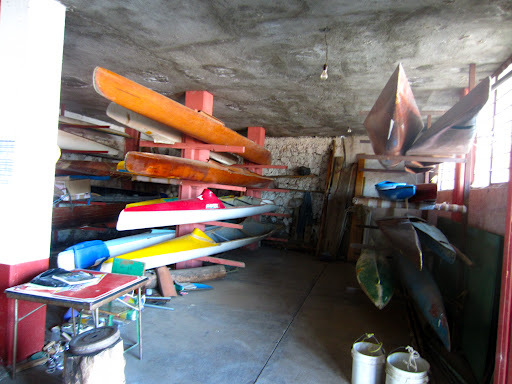 Worse, everyone we met said there was no way to get a boat out to the lake other than to go to the launch down in Patzcuaro. So hard to believe…. And then, suddenly, pavement appeared. The road was incredible! Smooth, easy; the views along this lakeside road are spectacular! It ran right along the lake, and did not appear on any of our maps nor on our GPS. But, it is most definitely there, and well worth the drive! We were told that the federal government had built the road, the northern portion of it had washed out, and despite the repeated pleas of the local residents to the government, no one has ever returned to repair it. It is passable; just the first 30 minutes of it on the northern end are not exactly easy riding. 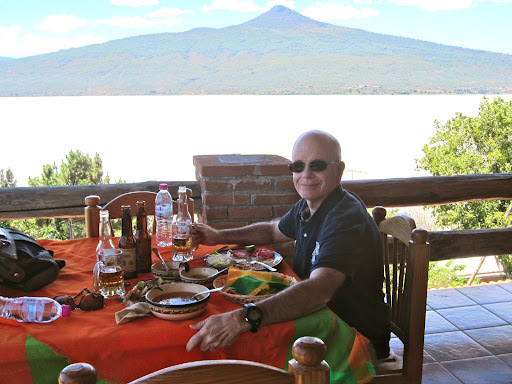 In Ucazanastacua we found a terrific restaurant (Huenan) overlooking the lake, run by a wonderful family who live in several houses down the hill on the lake itself. 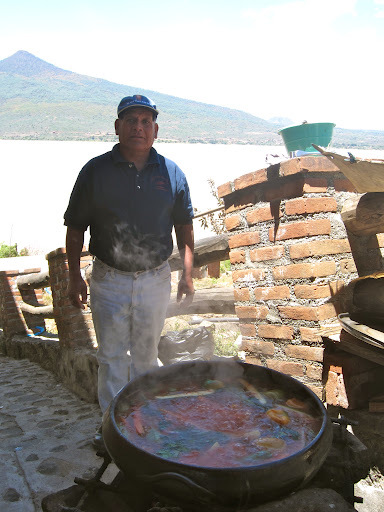 They had incredible views, fresh caldo de trucha (trout soup), caldo de camarón (shrimp soup), mojarra cooked any way you like it (crappie), corundas (small tamales), a gorgeous rose garden, and some of the most intricately embroidered blouses I’ve seen. 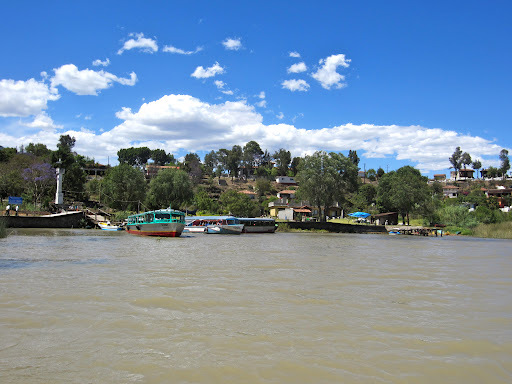 Anyway, everyone we had asked said the only way to get a boat on the lake was to depart from Patzcuaro. We must have had 20 people tell us this. Then, finally, as we were eating lunch, the owner told us that 1-1/2 km south of his restaurant was a boat launch. He advised us to use it. 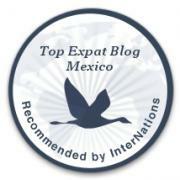 “You don’t want to go to Patzcuaro; it’s crowded there. 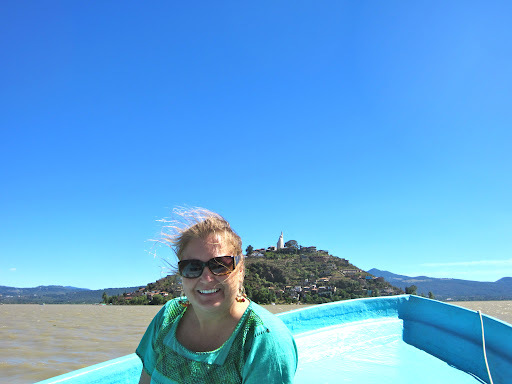 You’ll wait in line and they’ll put you on a huge tour boat and rush you over to Janitzio. Take a boat from here. There will be no line, you can take your time and enjoy your day. Plus, the boat launch here benefits our local community. The drivers share the earnings.” Man after my heart! He said to me just what we had been thinking! Yeah! Lo and behold, there was absolutely no wait, no crowds, and we could even rent a private boat and driver! Hooray! 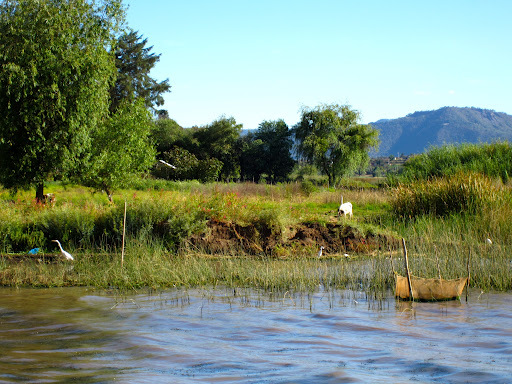 If you, like us, are visiting Patzcuaro during a holiday (Semana Santa, Day of the Dead, etc), and you want to avoid crowds and help a local coop, definitely drive north to the embarcadero/boat launch in Ucazanastacua! 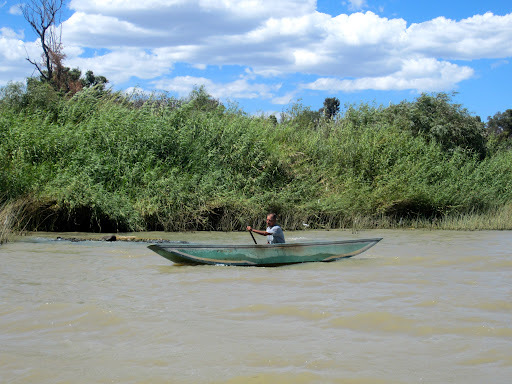 Our boatman was fantastic—Alfredo, the man of the big smile. I’d smile, too, if I had to shuttle these waters amidst this gorgeous scenery every day. 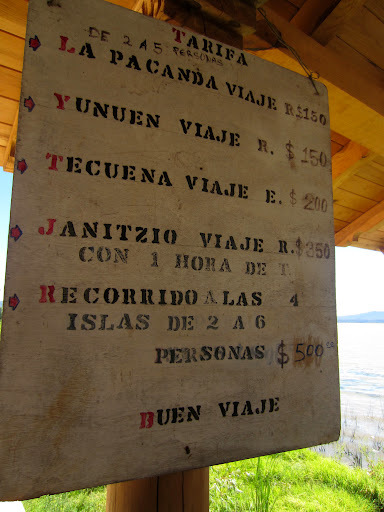 We told Alfredo we wanted to cruise around the lake, seeing all the islands, but avoiding the crazy crowds. 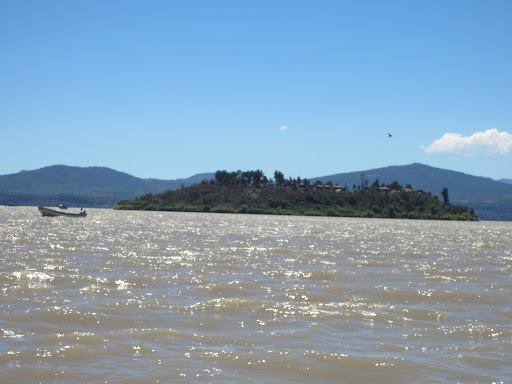 He told us how there originally were eight or more islands, depending how you counted, but that the lake waters had dropped over 3 1/2 meters, and now there are only four islands in Lake Patzcuaro. Above you can see a short video taken from the boat. We first drove around Pacanda Island. It was gorgeous—lots of green, plenty of space. 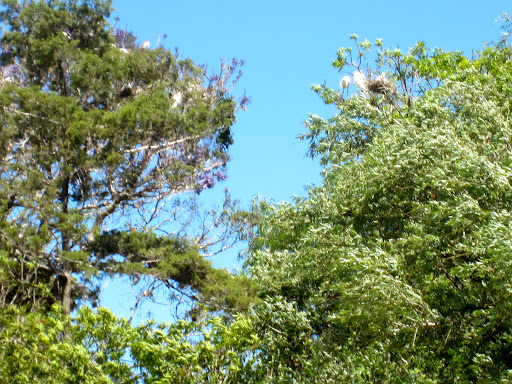 We saw so many cranes! Pacanda was just gorgeous! And so peaceful! 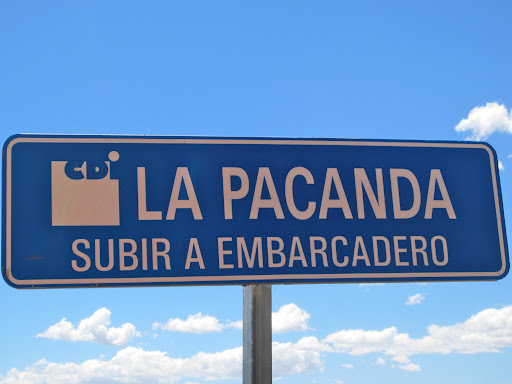 I asked Alfredo about the teleférico/cable car that I’d heard about, that was supposed to connect the islands of Yunuén and Pacanda. 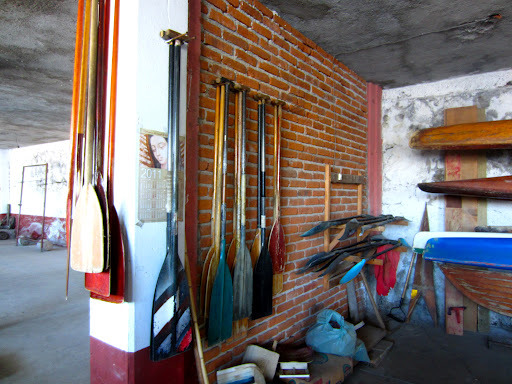 He told us that while the comunitarios on Yunuén had wanted it, the comunitarioson Pacanda had refused; they didn’t want to have tourists visit. When he said this, I thought what a shame it was, because a scenic ride between islands would be so beautiful, and surely they could control the tourist influence, no? In a minute you’ll see how wrong I probably was. 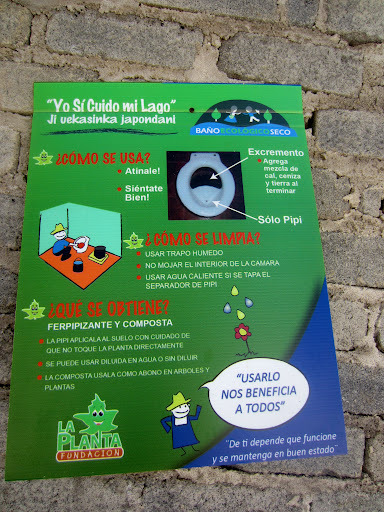 Alfredo next let us off on Yunuén Island, which the comunitarios there have decided to develop slowly, in an eco-friendly fashion. This island was gorgeous as well. There were simple cabañasat the water’s edge, and a more deluxe yet simple development at the top of the hill. Yes, this is what was possible. These people were developing eco-tourism in a way that was sustainable, pleasurable, that enabled them to keep a lifestyle and a pleasant place to live. Surely Pacanda could do this as well? The view from the top of the island, overlooking the town and the lake, is spectacular. 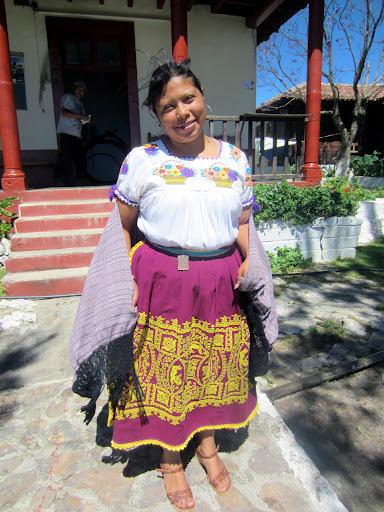 The ladies on Yunuén love to embroider, and I absolutely fell in love with their aprons! Unfortunately I was too cheap to pay the US$100 or so that I was asked to pay for this one. 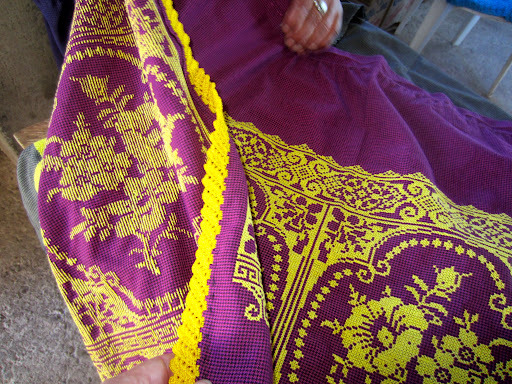 The handwork was so beautiful. This whole trip has amazed me, the intricate embroidery that we have seen! 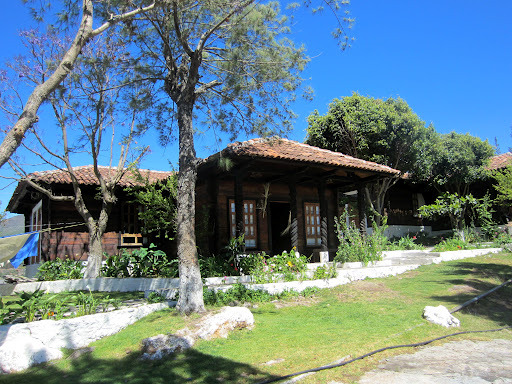 The cabañas on top of the hill are gorgeous. One for two people rents for 500 pesos per night. The cabañas have baths and bedrooms but no kitchens. There is a shared kitchen, and a restaurant. The gardener on the premises has a whole lot of fun, as you can see. in the cabañas down at the lake level. Yunuén had a good feeling. 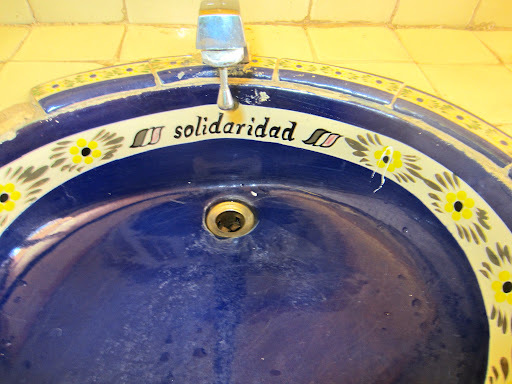 You could even sense it in the tilework on the sinks! The comunitarioshere seem to know the value of place, and they are, thank goodness, dedicated to protecting it. After Yunuén, we rounded Janitzio. It is so gorgeous to look at from the lake; you’ve seen the photos. 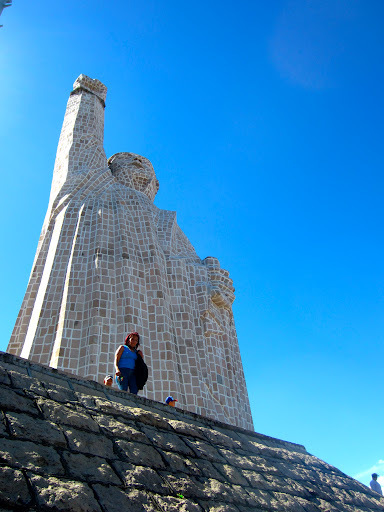 The large statue of Morelos at the top distinguishes it. 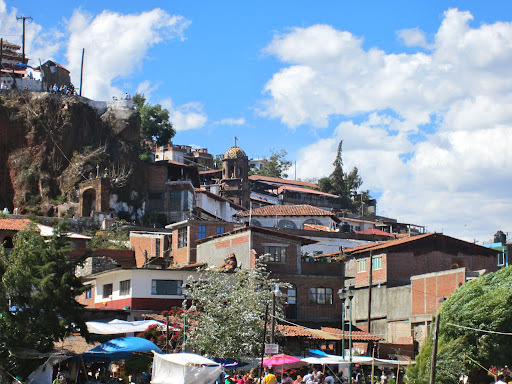 As you get closer, however, you notice just how overbuilt and crowded Janitzio is. There doesn’t appear to be much available space anywhere. 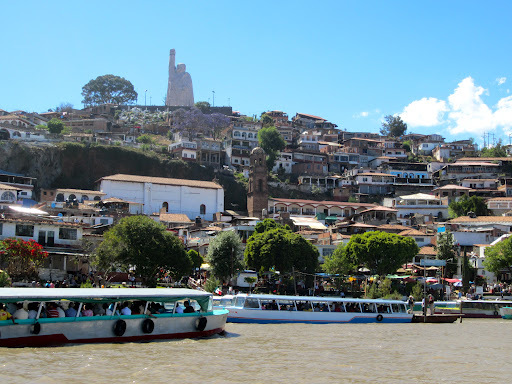 There were tour boats plying the waters back and forth from Patzcuaro to Janitzio, all of them filled with tourists during this Semana Santa holiday. 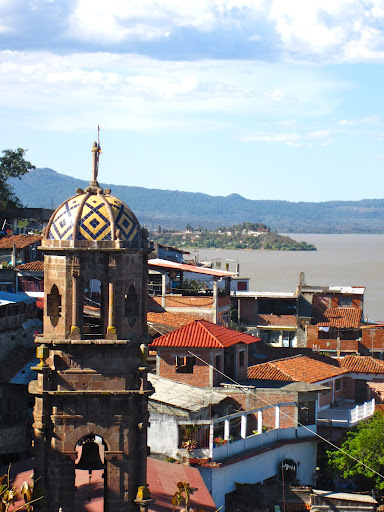 Once arriving in Janitzio, it was a solid line of tourists walking up and down the hill, as if we were ants going to an anthill. It reminded me of the entrances to some of the major temples in Kyoto, though there when you arrive at the temple proper there is usually calm. 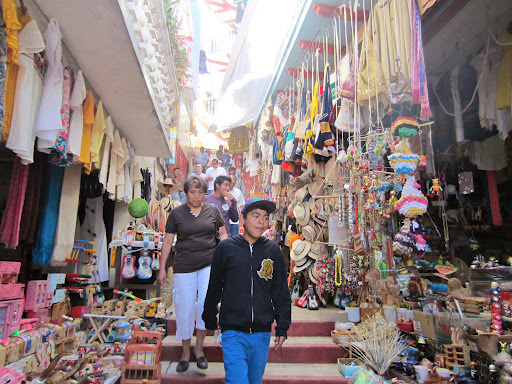 Solid tourist shops, from water’s edge to the top. Houses on top of one another with no room to breathe, no place that I could see to relax. THIS is surely why the people of Pacanda do not want development! Oh so clear! They don’t want their pristine island to turn into this! At the top, the wait to climb the statue of Morelos was one hour, so while we stood in line for about 20 minutes, we then gave up and left. 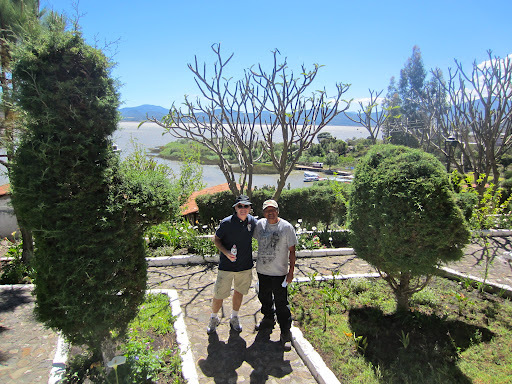 The view from top of Janitzio was very nice. Though I preferred the view from the winding trail up, if you could get out of the line of traffic, that is! 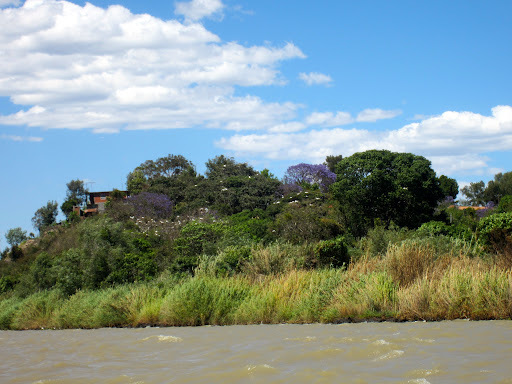 Though Janitzio was not my favorite island, there were two things I loved about it. 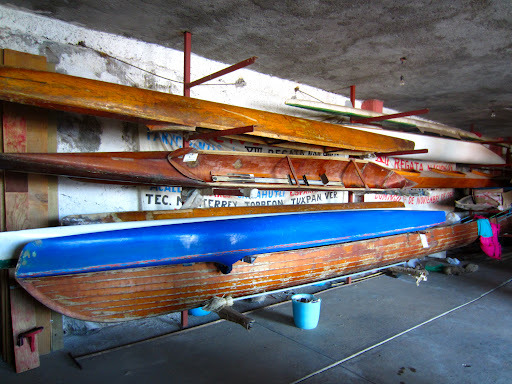 One was the very cool boathouse, at the far end of the embarcadero, where the pangasput in. 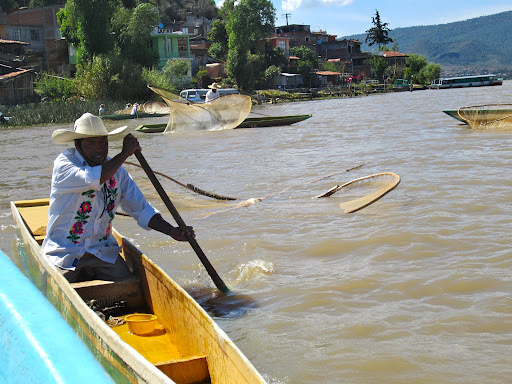 By far my favorite part of Janitzio were the demonstrations by the butterfly-net fishermen. 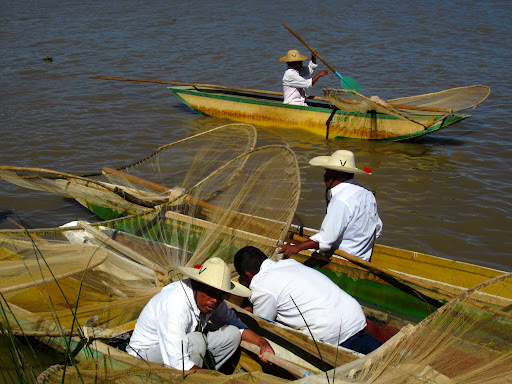 Above is a short video of the fishermen using their nets. I am so very sad to know that the people in this area no longer really fish this way. 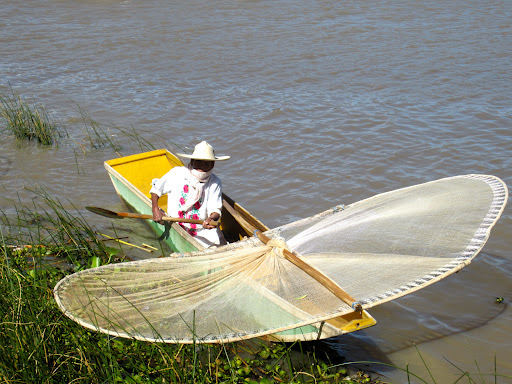 Alfredo told us that the lake has been heavily over-fished, and nowadays fishermen don’t really make a living using those beautiful butterfly nets we see in photos. Rather, these days, they put on “exhibitions.” Luck was with us and we were able to see one of these demonstrations up close and personal. Thank goodness the tradition lives on, at least for the tourists! It was an absolutely gorgeous day on the lake, and we felt extremely blessed. 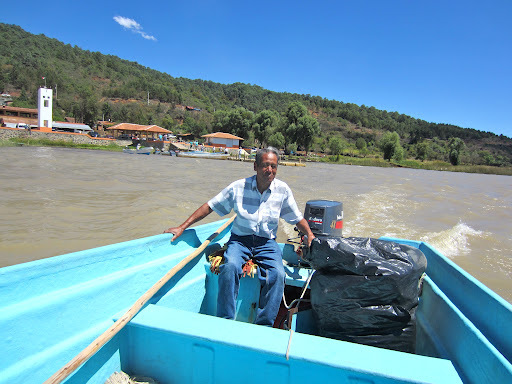 We found our “secret” boat launch, which I most highly recommend; we ate at the best place on the lake, I am sure (the caldo de trucha/trout soup ROCKED); it was sunny and clear; we had the lake’s happiest boat driver; and we got back to Morelia in daylight in plenty of time for the Procession of Silence. 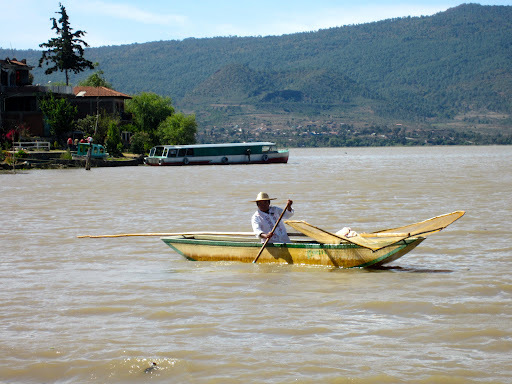 We highly recommend that, if you travel to Morelia, you spend a couple of days on the lake if you can. 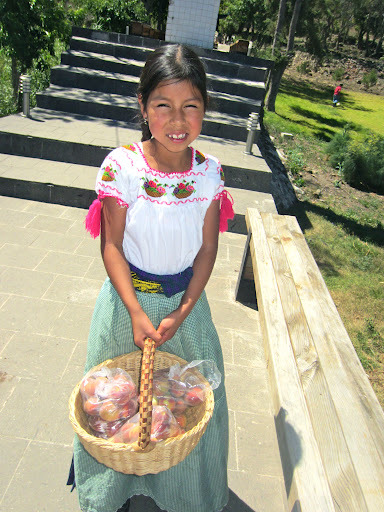 Visit the many pueblos that line the lake; they each have a style of dress and unique handicrafts in which they specialize. It has been by far our favorite aspect of our time here. 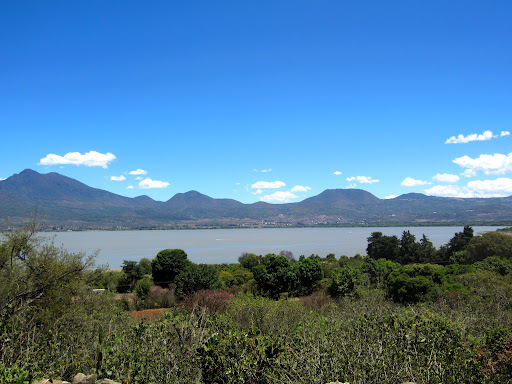 Morelia is GORGEOUS, but the Lacustre, the lake region, is a far too hidden treasure! 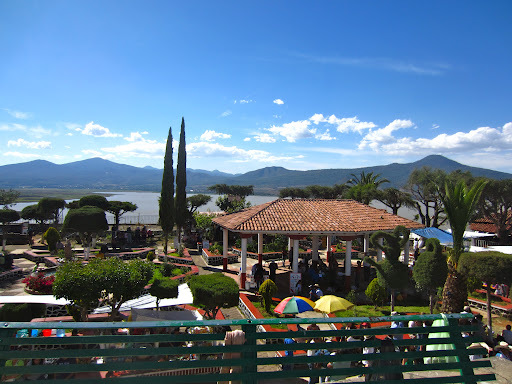 Addition on April 9: we drove around the west side of Lake Patzcuaro today. There is also a boat launch on this side of the lake, making at least a total three. 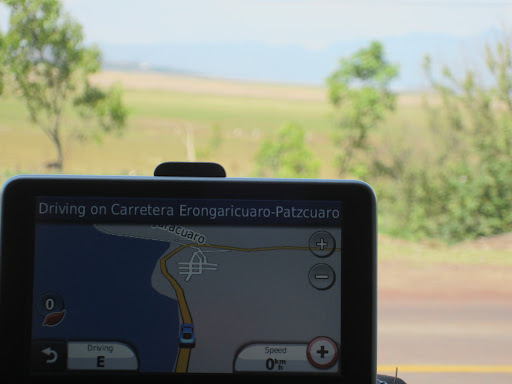 At left is a photo of our GPS, showing that the road we were on used to be lakeside. You can definitely see that it no longer is. Beautiful pics, thanks 4 sharing!!! So glad you enjoyed them, Mike! Thank you for letting me know! 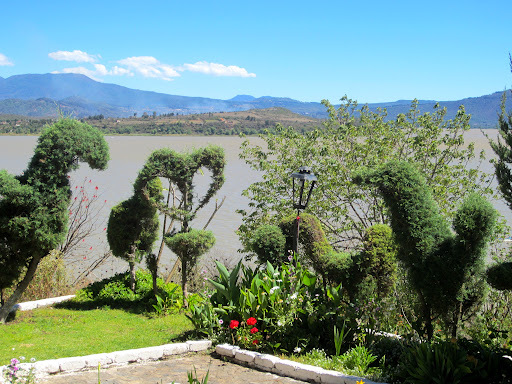 Do you live near Patzcuaro? Travel there?